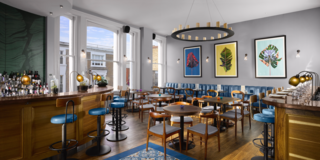 After just opening in mid-December, a new hotel in London’s Notting Hill district is a paradise for lovers of gin and spirit-inspired design. 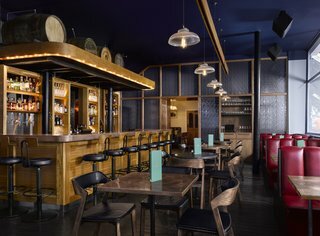 Built to provide a fully immersive experience for gin enthusiasts, The Distillery consists of three boutique guest rooms, two bars, a museum, shop, a gin-making experience, and the distillery of Portobello Road Gin—who is responsible for the concept. The four-floor destination is a place where enthusiasts and connoisseurs alike can be completely surrounded by the rich history of the spirit, and can see how its cultural significance has evolved over time. Located smack-dab in London’s Notting Hill district, The Distillery sits on a bustling corner of the iconic market street and is marked by a classic, nostalgic facade. The three boutique guest rooms feature a combination of midcentury furniture and playful, spirit-inspired accents. 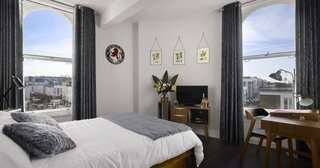 Designed by the brand’s founding directors, each room includes a minibar filled with spirits that have been crafted on-site, as well as a bespoke record player with a vinyl playlist that’s been curated by Rough Trade Records. When you visit The Distillery, you’ll find GinTonica on the first floor, a Spanish-inspired bar and kitchen that celebrates Spain’s beloved connection to juniper. You can try a number of different experimental takes on the Gin and Tonic, which is served in a traditional Copa de Balón—a balloon goblet glass. In The Resting Room, master distiller Jake Burger and a team of instructors create their gin in two 30-liter copper stills on-site. You can also test out a curated selection of international spirits that have been aged in handmade barrels that sit above the bar. The on-site distillery allows the bar to serve one-of-a-kind gin blends alongside unexpected spirits including olive oil vodka and avocado. 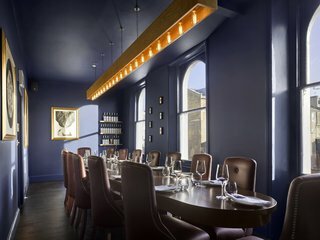 On the top floor is The Boardroom, a private dining room that hosts its own intimate bar. 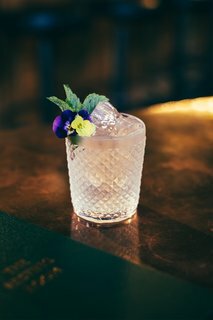 At The Ginstitute—London's well-known gin-making experience—you can concoct your own special blend of gin and take a journey through its rich history. Dive into The Distillery's world by booking an experience here.